After the success of Nearly Dead in Iowa, USA Today bestselling author Wendy Byrne is back with her sequel, DOUBLE TROUBLE IN IOWA. Amateur sleuth and artist Izzy Lewis returns to unravel another murder mystery and Byrne has taken time out to tell The Big Thrill about the attraction of this unlikely investigator. Her “unlikely crime solving buddies” or, as Byrne calls them, the Jessica Fletcher wannabes, help Izzy unravel the mysteries and secrets in the story, but they bring an additional dynamic to the book we don’t often see in cozy mysteries. “I liked the idea of breaking stereotypes and having her senior citizen lady friends be the risk takers and push Izzy to do things she might have been afraid of doing. I wanted to turn the tables and have her be the conservative one of the bunch,” Byrne says. This is never more so apparent than when they track down an informant in Hell’s Tavern, a broken-down trailer masquerading as a bar, and the older ladies encourage Izzy to take risks – causing much mayhem thereafter. Izzy and her entourage are not your usual crime solvers, and yet they’re tasked with uncovering the truth behind a murder. I asked Byrne how she manages to balance a grisly murder in the cozy mystery genre, whilst still giving fans of the series what they want most: a good whodunit. But it’s not all crime and murder. 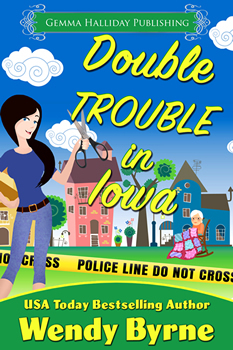 DOUBLE TROUBLE IN IOWA sees Izzy’s love life get more complicated. In this latest edition of the series, her interest is directed to her “hot” neighbor, Gabe. As well as being a love interest, Gabe is also another mystery for Izzy to unravel. With such a wealth of interesting and colorful characters, Byrne tells me, the Izzy Lewis series is set to continue. She is currently working on book three, concentrating on Sheriff Nate and his own mystery, as well as percolating ideas for book four with a focus on the crime solving old ladies and a mystery man. 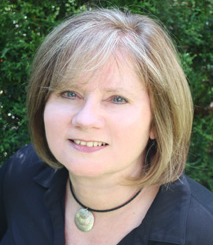 As well as the Izzy Lewis series, Byrne is also involved in self-publishing a suspense series, Troubled Boys, Strong Men, inspired by her background in social work. “I wanted to explore the idea of a group of men who came into the foster care system and were taken in by a foster mom who turned their lives around,” she says. Book one, Accuse, and book two, Abandoned, are both available to buy now. Byrne has also had recent success with her book Hard to Stop from her Hard Target series, which was a finalist in several contests. What’s more, she also mentions that all three books in the series will be on sale in mid-October. In the forthcoming months, Byrne is planning to visit the setting of her Izzy Lewis series, Iowa, to see all of the amazing places she came across in her research for Nearly Dead in Iowa and DOUBLE TROUBLE IN IOWA. While there, she hopes to visit some bookstores in the area and possibly set up some signings—so keep a look out if you’re in the neighborhood. Wendy Byrne is a USA Today bestselling author who lives in the suburbs of Chicago with her husband. She loves to take long walks and think about plot twists and turns. Most days you can find her pounding away at her laptop spinning tales and inflicting mayhem on her hero and heroine until they beg for mercy. She writes everything from cozy mysteries to romantic suspense, all infused with a touch of humor. L E Fitzpatrick is a writer of dark adventure stories and thrillers. Under the watchful eye of her beloved rescue Staffordshire Bull Terrier, she leaps from trains and climbs down buildings, all from the front room of a tiny cottage in the middle of the Welsh countryside. Inspired by cult film and TV, L E Fitzpatrick’s fiction is a collection of twisted worlds and realities, broken characters, and high action. She enjoys pushing the boundaries of her imagination and creating hugely entertaining stories.